Re: Pre GPC - use GLBasic with you favorite IDE.. Thanks a lot, and Welcome, I think you are "newbie" here!!! Setup is really simple, only few steps, I have change first post a little so now it's clearly written how to setup app. I looked into CodeBlocks custom syntax highlighting and it's little complicated - need to write scintilla lexer and some additional things. Is there any other good, free IDE with auto-completion, hints with easy configuration for custom languages? Or it would be better to write new IDE from scratch.. I now text Editor 2, it's possible configure our own languajes and put the keywords for autocomplete. Re: NEW IDE for GLBasic, and Pre GPC - use GLBasic with you favorite IDE..
hm.. no replies? 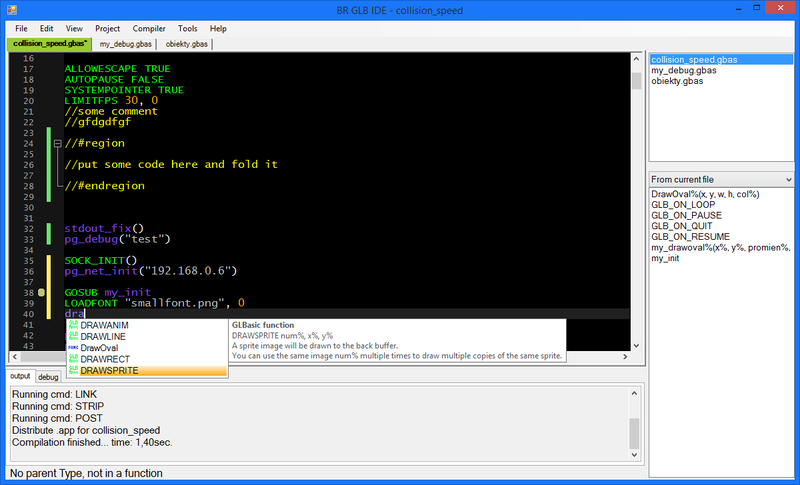 :p Unfortunately I didn't found other good cross language IDE that could be easily configured to use with GLB, and would have all needed features, so I decided to write my own editor for GLB. Based on ScintillaNet and written in VB .Net, most important to me is to have hint's for user typed functions and auto-completion for them. Still .Net version of Scintilla is old and doesn't have all newer features and bugfixes but it should be sufficient for what I plan to add in my editor. You can download current version from first post, this is very limited release - just to show how hints and other stuff will work, I need to finish some things, then I will add compiling, and later other features. Ah and remember it's not planned to be most beautiful IDE, just to have all features working. i wish we have a ide written in purebasic for win/mac/linux . Use Net o PureBasic what advantage have front GLBasic, the buttons or make the IDE?¿. In short, GLB isn't best language for making applications, you would need to made advanced edit control with many features similar to Scintilla, all ui stuff, and so on.. It tooked to long but I returned to this project some time ago and now you can see what is new in 3 public version of my IDE. To compile projects you need copy 'glblicence.inc' file from 'C:\Users\-X-\AppData\Local\Temp\glbasic' to ide application dir - standard glb ide generates that file before compiling. and use 'stdout_fix()' function at start of your sources. If there would be some problems with refreshing variables, functions, save current file or switch to edit another file in project and get back to previous file, that will parse first file again, and all missing stuff should be recognized. Edit: current problems: arrays bug, does not recognize function arguments as local defined variables.. I will check this out later. Little update, arrays parsing fixed, all word identification functions are using custom code now (so #$% are no longer problem, at least shouldn't be). The priority is to add new functions for tracking changes in code. btw. in first post I have attached gif that shows how autocomplete functions is working with types. Ops, I will bring some comments today or tomorrow, got into some workload here that is detracting me from doing the things I want. If i leftclick on the codeside i got a error, see attachnment! System.InvalidCastException: Ungültige Konvertierung von der Zeichenfolge in Typ Integer. ---> System.FormatException: Die Eingabezeichenfolge hat das falsche Format. bei WindowsApplication1.Form1.Search4NestedInfo() in D:\projekty\vstudio\my_glb_ide\Form1.vb:Zeile 1172.
bei WindowsApplication1.Form1.Scintilla_List_Click(Object sender, EventArgs e) in D:\projekty\vstudio\my_glb_ide\Form1.vb:Zeile 542.
bei ScintillaNET.Scintilla.WndProc(Message& m) in C:\Users\jslusser\Projects\ScintillaNET\Releases\2.5\ScintillaNET\Scintilla.cs:Zeile 2222.